Following our premise of offering only the most efficient spare parts and equipment, Trasteel Tech provides with a range of hydraulic hammers for mini and light excavators with characteristics with some particular features that makes them unique in the market. These features offer the customer a tremendous return on investment. 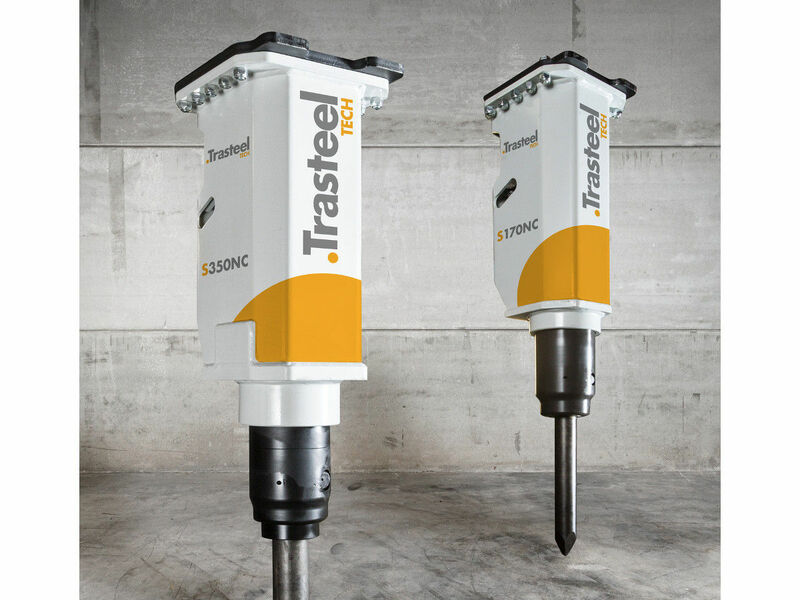 Trasteel Tech hydraulic hammers are recommended for all types of works. Our hammers deliver much more power, which increases the hourly output of the machine, as well as offering very comfortable working conditions for the operator, contributing towards increased productivity. All these benefits are based on 5 main features exclusive of Trasteel Tech hammers. The compact, one-piece main body offers increased torsional strength, which equates to reduced breakdowns and maintenance costs. Fewer parts exposed to stress and ease of repair. Besides, it generates less noise at each stroke, providing greater comfort for the operator. The membrane-free hydraulic accumulator system provides up to 40% more power than other hammers of similar weight under similar working conditions. A hammer with more power breaks the hardest materials and is, therefore, more efficient. Trasteel Tech breaks what others cannot. The force generated by the piston hitting the chisel is exerted exclusively by the gas pressure. The hydraulic pressure only serves to lift up and compress the gas in the accumulator. This system, in addition to providing more power in each stroke, is less demanding with the excavator, prevents overheating in the hydraulic circuit of the machine and reduces the return pressure. All this results in lower maintenance costs both in the hammer itself and in the machine, helping to reduce fuel consumption. The simplicity in its design and construction makes Trasteel Tech an efficient hammer even when it comes to maintenance. The distributor is independent of the main body, and its easy access allows very simple and quick troubleshooting. Also, there is no collision or direct wear between valve and piston. In horizontal demolitions or narrow trenches, it allows the operator to keep the tip of the tool in full view at all times and take advantage the most of spaces. Its housing also isolates and muffles noise, increasing working comfort for the operator and his environment. Trasteel Tech goes where others cannot even get close.